Ciftci joined the department in 2008 after receiving his Ph.D. in political science from Florida State University. He specializes in Middle East politics, political Islam and democracy, Arab public opinion, civic engagement in the Arab world and anti-Americanism in the Middle East. Ciftci’s research on these topics has appeared in a number of prestigious journals in political science and Middle East studies, including Comparative Political Studies, Political Research Quarterly, International Journal of Middle East Studies and Social Science Quarterly. He is passionate about the study of politics in the Middle East, and such passion is apparent in the classroom. Not surprisingly, his courses are popular among political science majors and non-majors alike. 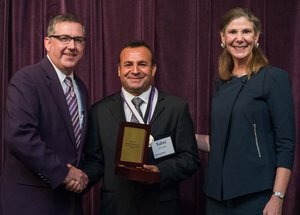 It was largely through the efforts of the chair’s honoree, Michael W. Suleiman, that K-State developed a widespread reputation for excellence in the study of Arab and Arab-American issues. A K-State faculty member for over forty years, Suleiman was a leader in the study of Arab politics and a pioneer of the study of Arab-American relations. To honor his legacy and strengthen the study of Arab and Arab-American issues at K-State, John Hofmeister, former President of Shell Oil and founder and CEO of the non-profit Citizens for Affordable Energy, made a lead gift in 2005 to establish the Suleiman Chair and was instrumental in initiating support from Shell Oil. Hofmeister is a K-State Political Science alumnus, graduating with a bachelor’s degree in 1971 and a master’s degree in 1973 from the department. In 2014, he received an honorary doctorate from K-State.